A distant world in orbit around a binary red star set, light years away, holds the promise of humanity’s future. It also contains a deadly secret that unleashes the worst of all greed and the unthinkable—those who would kill for blood. When Lieutenant Colonel Kathy Selina is offered the choice to relocate to the Antyllus colony, she hardly has a choice. The military has not only training and time invested in her, but she’s also been given a new SUB body to defeat the deadly disease that would have killed her, as a human. Kathy, along with her executive officer, Major Dave Mitchel, a handful of SUBs, and the members of the Colony Defense Force, must pit their skills and abilities against the most malevolent enemy the universe has ever faced. Failure will mean a terrible end for the planet’s native inhabitants, those who’ve come to colonize Antyllus, and certain death for the small cadre of defenders, as well. 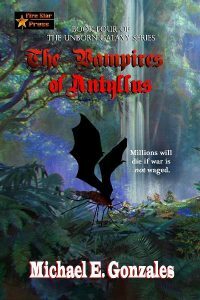 In a deadly game of cat-and-mouse, how can Kathy, Dave, and their band of soldiers defend an entire world against THE VAMPIRES OF ANTYLLUS?